Mike Zito, Cyril Neville, Shawn Holt & The Tear Drops, Samantha Fish, Hamilton Loomis, Mr. Sipp, and many more. While other guys his age were going to college, getting married, buying homes, and building professional careers, Hector Anchondo was playing guitar. He lived on the road, and when he wasn’t on the road, he lived on couches. He got jobs as he needed them, but quit as soon as he could get back on tour. He put off having kids. He put off marriage. Instead, he played guitar. His guitar playing became a thing of legend in the Omaha area, where he was based. His dazzling introduction of “Black Magic Woman” stunned audiences who thought they had heard everything. Decades of single minded devotion to his craft showed every time he played. But as much as he was beloved by thousands of fans in the Heartland, he remained largely unknown to the rest of the world. “It was a lot of sleeping on floors, or in the van, or just driving on through to the next show,” he said. Anchondo knew his mind, though. It was guitar or nothing. And, he realized, this could be the moment he finally got to do a thing he’d wanted to do all his life. He had loved the blues since he was kid, had been sneaking in blues songs at his concerts for years. He wanted to play blues full time. So he started looking for other musicians who could help him make the hard-partying kind of blues he’d always loved. When you put your mind to doing the thing you were born to do, the universe helps. Anchondo got an unexpected call from an old friend in St. Louis. He’d been a fan of Anchondo’s Latin music, but he had always loved those blues songs Anchondo snuck in even more. Anchondo wrote 30 songs that summer, narrowed it to five, and put out an EP called Kicking Up Dust. The album did well; he did Young Guns two years later. 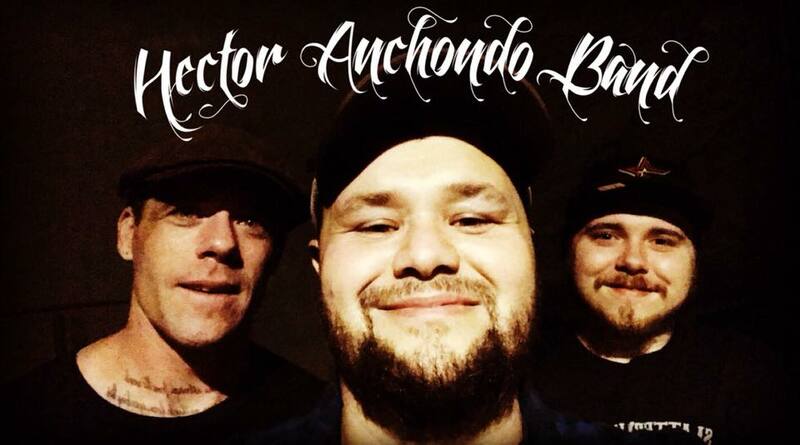 Omaha embraced Anchondo’s new direction and his tight, powerful band and sent them to the International Blues Challenge twice. In 2015 they made the semi-finals; in 2016 they made the final nine. The album, Roll the Dice, was the best thing Anchondo had ever done. It was saturated with his history of blues, with flavors of Latin, rockabilly and Americana. It showcased the flawless, fluid and brilliant style that he earned in 20 years of love and discipline. There was buzz around his band, he knew. He was on the verge of breaking onto the national scene. He wanted to release the album and make it count, but he wasn’t sure how to go about it. Already another album is in the works, and Anchondo is expanding his tour base. Soon audiences all over the world will get a chance to experience what Omaha fans have loved for so long; the smooth smoky voice that can make you smile even as tears fill your eyes, the audacious grooves of his powerful band, and the lyrical mastery of Anchondo’s guitar, telling the story of a life lived for the love of music. Put this in the “If you haven’t yet, you really should” category; join us at The Revue Lounge…Hector Anchondo has been rippin’ the place up.